Kunzite is a very lovely brilliant stone occurring in delicate lilac, pink or violet shades. Millions of years ago gemstones were created in numerous variations, mother nature loves diversity. We are familiar with most of them and in most cases for thousands of years. Yet every now and again a previously unknown variant of a gem comes to light. 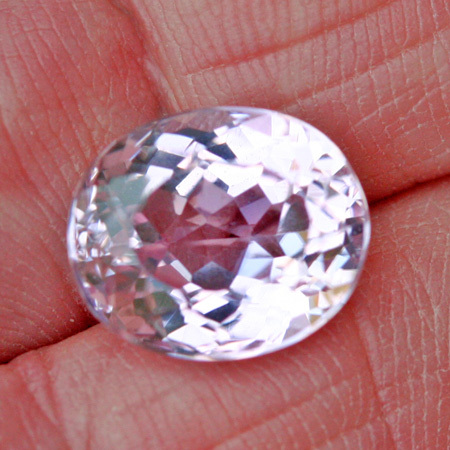 Kunzite is a very young gemstones known for a little more than one hundred years. Pale Pink kunzite was discovered in 1902 in the Pala District of San Diego County of California. It was not until 1902 that the New York jeweler and gemstone specialist George Fredrick Kunz became the first person to give a comprehensive description of this stone, which had just been discovered in California. And since newly discovered gemstones are usually given the name of the discoverer or patron, This new pale pink gemstone was called "Kunzite". Today gem quality kunzite is mainly found in Afganistan, Madagascar, Brazil, and the United States. The overall appeal of this gemstone lies in its clarity and its fine delicate pink nuances which often display a hint of violet. These are delicate, tender hues, feminine and seductive; making it an attractive eye-catcher in jewelry. Cut kunzite surprises even the experts again and again with its brilliance. The silvery gloss on its facets forms a beautiful contrast to the fine violet-pink of the gemstone. Kunzite is a trichroic gemstone with strong pleochroism the meaning of which equates to multi- coloredness. The hardness is 6.5 to 7 on the mohs scale making it a durable gemstone for all forms of jewelry. Due to the strong pleochroism it makes the cutting of kunzite difficult. In order to make sure that the fine color is shown to its full potential, the cutter must align the raw crystal very precisely during his work. The reason being depending on the angle from which you look at a kunzite, it may appear violet, pink or even colorless. In a well cut stone the most beautiful color nuance will always be visible from above. The more intense the color the more valuable the kunzite. Whether the gem is more pink or lavender is more or less a personal preference and skin type, the color tone should be light but strong. Kunzite with its delicate pink and lavender is not only an ideal precious stone for lovers; it is also popular as a healing stone. Kunzite is said to enhance a person's capacity for devotion and understanding and to bestow inner peace on its wearer. It is also said to activate the mind and liberate us from worry and anxiety. Whether or not one actually believes in the positive effects, one thing is certain; its fine pink and lavender radiates a serene composure and keeps moods of depression and anxiety at bay. Depending on the light source when viewed this gem will appear light purple to a Morganite slightly orangish pink color. Excellent cut and polish, Calibrated easy to set in jewelry. VVS, loupe clean clarity.